Q. Where can I find an article for my medical terminology paper? 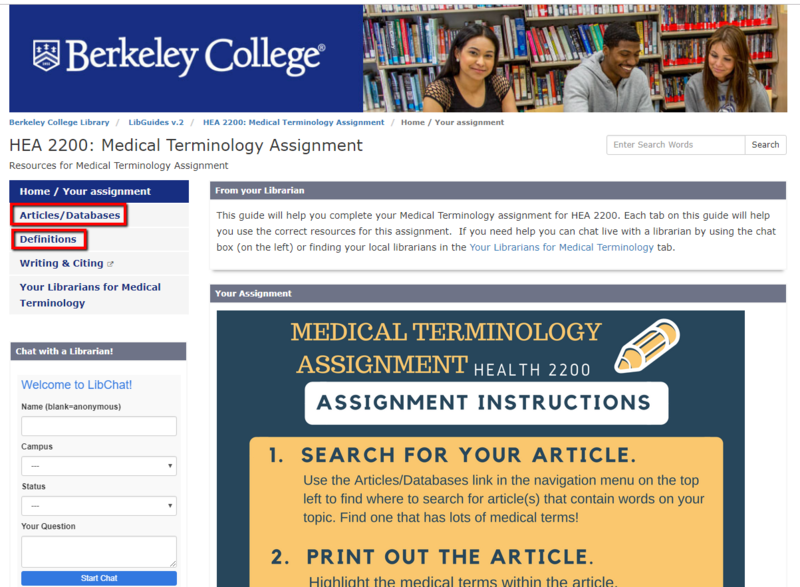 Where can I find resources for my medical terminology class? The best database to use is ProQuest Health & Medical Collection, which has articles from many medical journals, if you are looking for articles with many medical terms in them. There is a LibGuide (library research guide) that was created especially for the HEA 2200 Word Parts assignment. It contains an APA template and links to this database and other good places to search for articles, definitions, and lists of prefixes, roots & suffixes needed for this class. The Articles/Databases page (on the left side of the screen) has links to good places to find articles about a disease. The Definitions page has online and in-print medical dictionaries to help you throughout the class. It is especially useful for the assignment to find a journal article with many medical terms, pick out the terms, then define them and break them down into word parts for your final paper.